Make it easy for your guests to find their way on campus by reserving a set of Directional Signs. Please reserve your signs at least three business days in advance to avoid late fees. Road Signs offer turn-by-turn directions from any of our seven campus entrances to the parking lot of your choice. 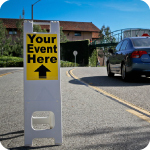 Pedestrian Signs lead your guests from the parking lot directly to your event location.